The ALMA (Atacama Large Millimeter/submillimeter Array) radio telescope, inaugurated in March 2013, was already used to observe the activity of that supermassive black hole in the heart of the galactic cluster Abell 2597 in a research reported in an article published in the journal “Nature” in June 2016. 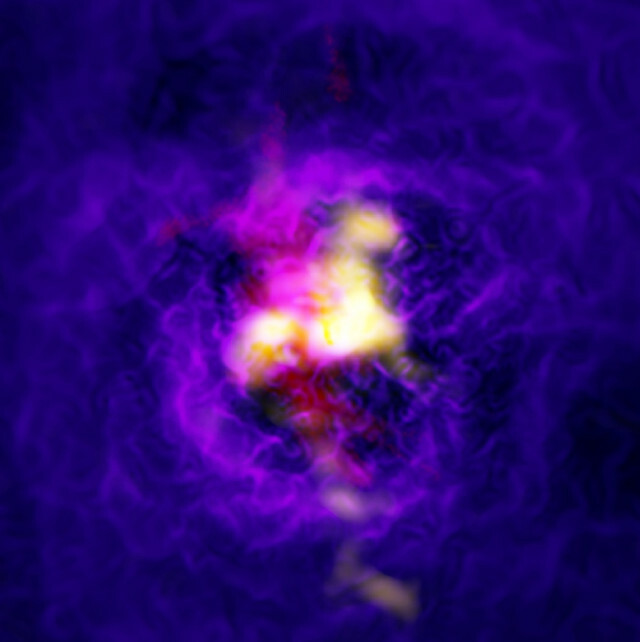 A team led by Grant Tremblay of Yale University had described a sort of intergalactic deluge of gas that from large clouds fell towards the supermassive black hole. The researchers continued to study what’s happening in that area and have discovered a more complete cycle. Using the ALMA radio telescope, Grant Tremblay’s team tracked the position and movement of carbon monoxide molecules within the gas cloud that are falling toward the supermassive black hole. Those molecules are very cold, with temperatures that can reach minus 250-260° Celsius. The researchers also used the MUSE (Multi Unit Spectroscopic Explorer) instrument on the VLT (Very Large Telescope) to track hotter gas that gets ionized and therefore is in the form of plasma, in jets ejected from the black hole. The combination of two instruments with different characteristics and therefore able to detect different wavelengths allowed to observe both the inflow and the outflow that powers what was called a galactic fountain in which the supermassive black hole acts as a pump. In the complete cycle the cold gas falls towards the black hole, which consequently launches jets of incandescent plasma at very high speeds outwards. However, the plasma remains in the galaxy’s gravity’s grasp, cools down, slows down and eventually falls towards the black hole again, restarting the cycle. The new observations confirm even more than the research published in 2016 the current theory, which sees this sort of galactic fountain as a common process but it’s the first time that the entire cycle is observed completely within the same galaxy. This could be an essential process to understand the formation of galaxies and the influence of supermassive black holes on the galaxies that host them. In recent years, various researches tried to understand the mechanisms that link star formation and therefore the life of galaxies to the activity of the supermassive black holes at their center. The observation of this sort of galactic fountain in the Abell 2597 cluster could provide important information to understand those mechanisms.